Hey Snugbugs! 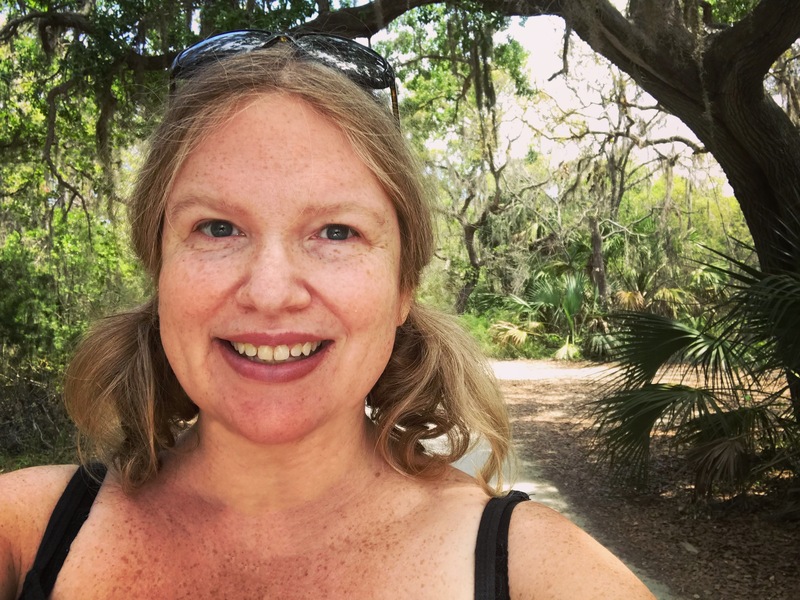 I’m coming at you with another fun new project! 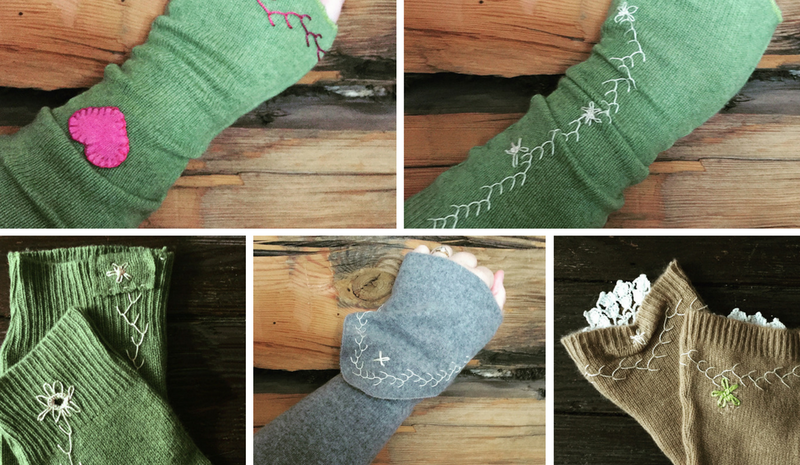 Unlike the last few finished projects, like the Jane Tunic and the Cozy Wool Socks, these cashmere wrist warmers weren’t made just for my pleasure, I made them for our shop. Although, to be completely transparent, I did manage to sneak a cozy, thick cabled pair for myself! 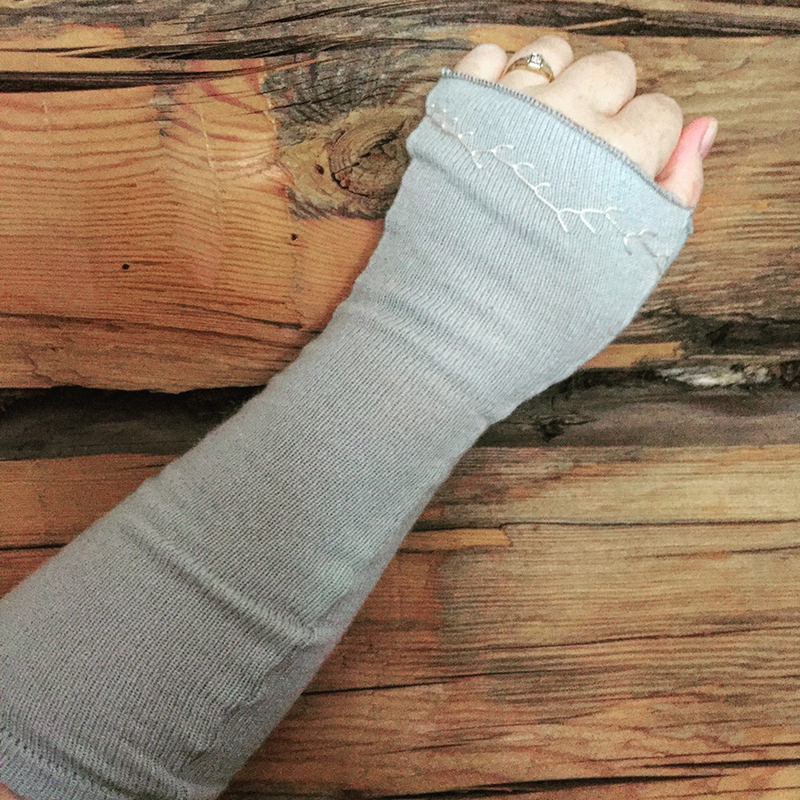 The wrist warmers are a quick and easy upcycle that’s absolutely perfect for those of us in the frozen north. Jeff and I have dubbed them Hand Spats – I love that! It’s like Jiminy Cricket. But with cashmere. I wear mine tucked under sweaters, which makes everything warmer and adds length to inconveniently short sleeves! 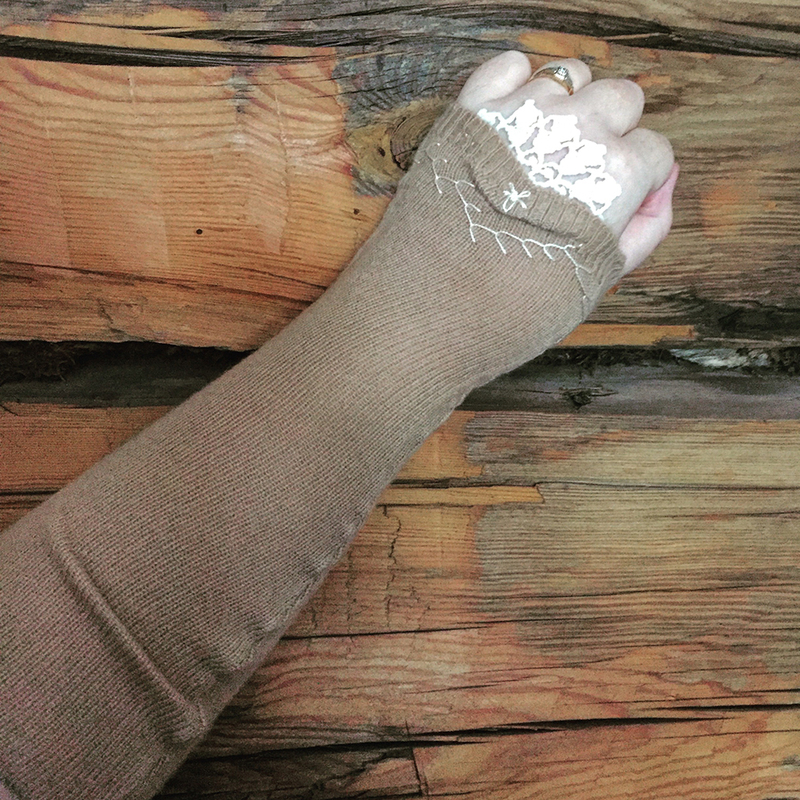 I love contrasting colors, stitching and vintage trim peeking out at the wrists of every day sweaters! Comb through thrift shops for cashmere. It’s pretty easy to develop a feel for it, although honest to god, I still get tricked by cheap acrylic ALL THE TIME. Which causes me to wonder late at night why I even bother with lovely natural fibers when cheap acrylic apparently feels the same… In any case, whether you find cashmere or acrylic, a sweater at a thrift shop is usually less that $5 bucks and will yield at least two full pairs of Hand Spats + enough left over to get all funky and creative with the pieced together look. Which I haven’t attempted. Yet. Cut out some pattern pieces. I usually use the arms of the sweater for one pair, then cut another pair from the body of the sweater. If you’re careful, starting with a larger size sweater and there aren’t any holes in the fabric, you might even be able to get two full sets of Hand Spats from the body of a sweater. Cashmere’s especially prone to getting holy. It is a sacred fabric. For the pattern shape, I started out by freeform cutting a vaguely hourglass shape, with the narrowest part, meant for the wrist, offset towards one end or the other. If there’s ribbing on the sleeves or the bottom of the sweater, place the pattern piece on the sweater so that one end of the spat will be already finished. Cut two of each pattern piece for each Hand Spat. So you’ll need four cut pieces of fabric for each pair of Hand Spats. If you’d like a PDF copy of my pattern, get on the waiting list at the end of the post! If you’d like to draft yourself, The S/M pattern piece measures approximately 2.5 – 3” across (measured flat) at the narrow part and 4” at the widest part. The L/XL is approximately 1” wider overall. Both sizes are around 14” long and I use a 3/8” seam. A) Serge the hem… If you’re not familiar, a serger (overlocker to my non US friends!) is like a sewing machine, but it uses more spools of thread and wraps the raw edge of the fabric while sewing. This creates a super finished look, but sometimes can make the finished hem a bit wavy and bell-like, which is cute, but not always the look I’m going for! B) Use a bit of ribbing from the neckline or unused bit of sweater hem… If you have enough ribbing — perhaps from the neckline or waistline — trim it carefully with sharp scissors. Overlap the ribbing over the unfinished hem and attach with a regular zig zag stitch, sewing ‘flat’ — the zig zag is meant to be exposed on the finished spat. C) Leave unfinished! 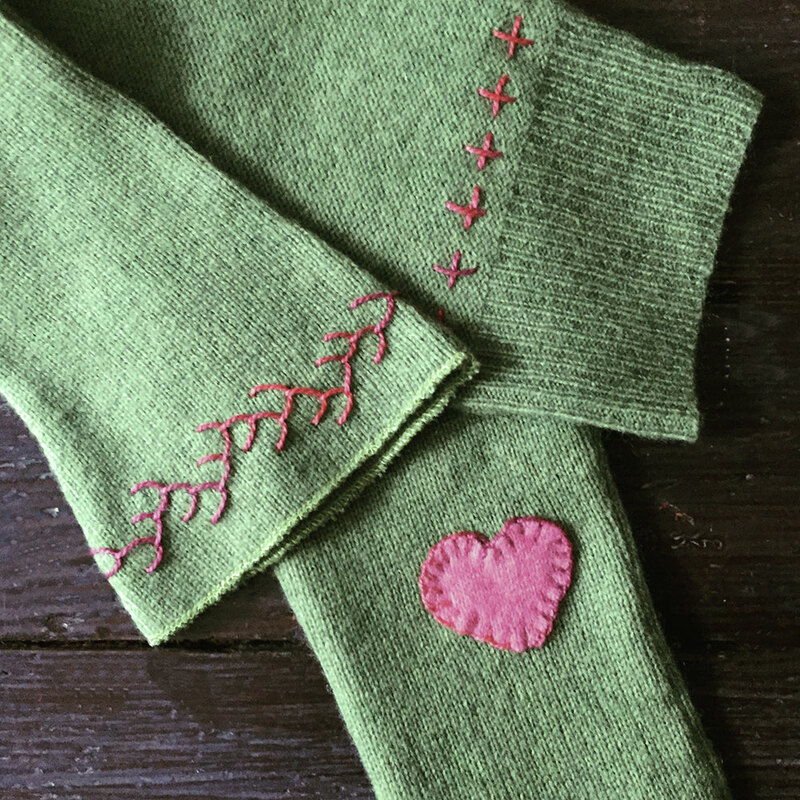 Knit fabrics are usually pretty stable and you might not need to finish the hem at all. If you’re worried about it unraveling, run a line of zig zag near the cut edge — line up the side of your presser foot with the raw edge — it’ll be hardly noticeable and very clean. D) Fold under hem… If you don’t have a serger or enough ribbing and really don’t like the unfinished cut edge look, go ahead and do a simple fold over hem. It can be a little tough getting a narrow hem to look nice on knit fabric. My favorite method is to run a line of straight stitching close to the cut edge (again, use the presser foot as a guide) and then use that line of stitching as a ‘fold line’ and guide to hand stitch the raw edge to the inside. If you don’t like to hand stitch, you could try using a 1/4” doublesided tape like Wondertape to hold the folded over hem in place long enough to stitch a narrow hem on your machine. It won’t be perfect — your hem is curved and Wondertape is not. Just use short pieces, not a continuous length, get it folded over as best you can and steam the heck outta it to get it all smooth and in place before stitching up. OK! You’re ready to sew ‘em together! It might be hard to see, but there IS a right and wrong side to commercial weight cashmere fabric. The ‘right’ side looks like a lotta V’s all in a column. The wrong side (that will touch your skin) looks like wavy lines. Put the right sides together and sew up the side seams. If you’re stitching with a regular sewing machine, sew with a narrow zig zag to allow for stretch and trim the excess close to the zig-zag line. 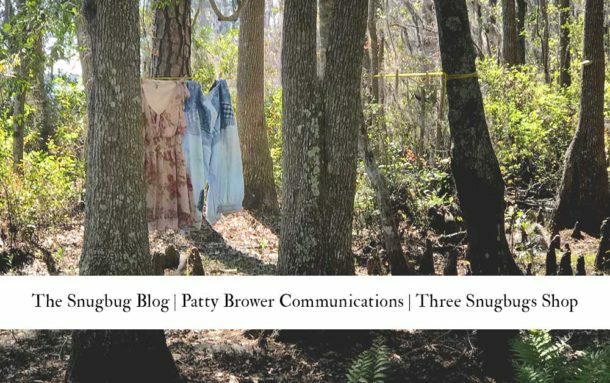 If you’re stitching with a serger, I usually use a narrow three thread overlock with pretty tightly packed stitches — practically the rolled hem sitting. Once everything is stitched together, flip so the spat is right side out and hit it with a nice steamy iron to make everything all nice and smooth. B) Vintage crocheted doilies… I buy doilies at yard sales and thrift shops and have a pretty large stash that I like to use on the hems of bloomers and handspats. You can cut the doilies into pieces – just pay attention to how they are constructed! I like to stitch a wedge into the inside and then gather up the knit fabric and stitch down to show off the frilly! 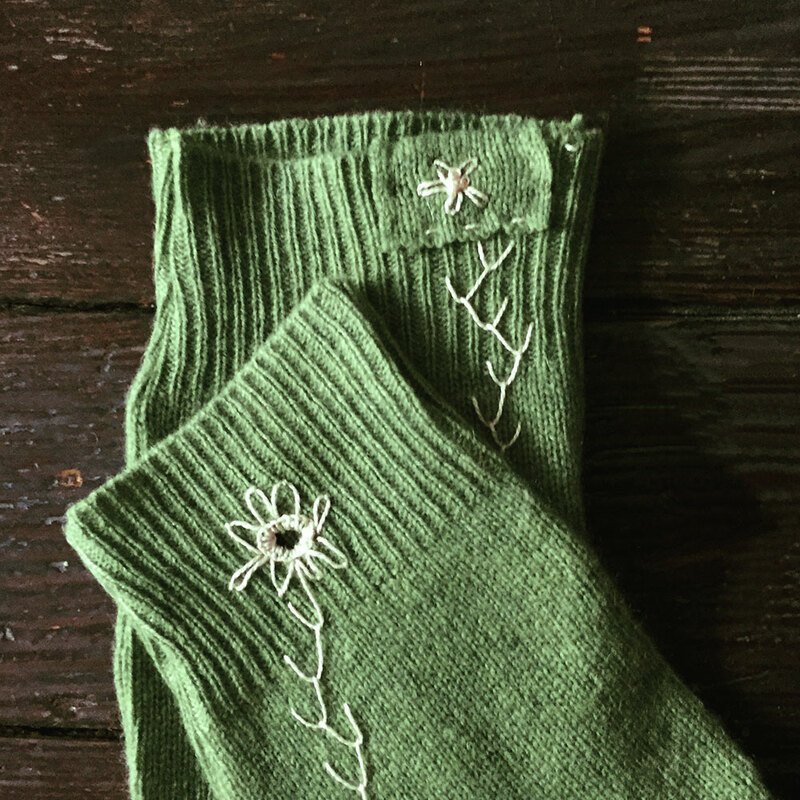 or make the hole into a design elemement by finishing off with a buttonhole stitch and making that the center of a flower! Whew! Totally fun, right? If you’d like to make yourself, then head out to your local thrift shop to stock up on some nice cashmere (or I guess merino’s alright… NO ACRYLIC!) You can get the heavy pearl cotton at any craft shop and possibly even the big box store that shall not be named. If it’s your first time playing with it, make sure you also have a needle with an eye large enough for the heavier weight — I often use the smallest size of my knitting darning needles when working with pearl cotton. And you can freeform the pattern like I did or if you REALLY like to start with a pattern, I’ll be pulling mine into a PDF version that I can send to you — just drop your email in the box below and hit the button! If you’re not the sewing type but definitely the hand spat wearing type (or know someone who is and is in desperate need of a gift) check out our online shop at Northern Comfort and see what we have available!